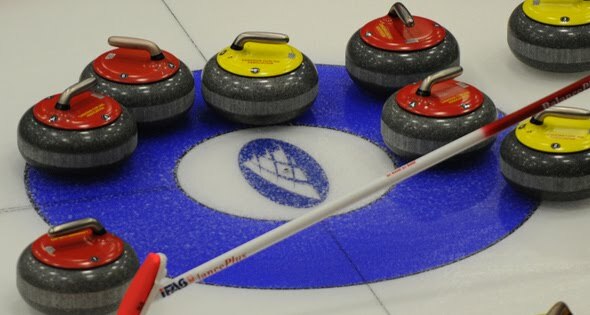 Willie Jamieson and Gordie Kennedy from Ballindalloch Curling Club, ably assisted by Dave Kelly (Aberdeen) and Simon Elder (Perth), started their now annual quest for the Scottish Seniors title. Drawn in the only 6 team group of the competition their first game of the campaign was against Alastair Galloway's rink from Murrayfield in deepest darkest Ayrshire last Friday. After coming through a nervy first end, where a one was forced, they settled into the game with a well constructed six. Steals in the following two and a big four in the 6th ensured an early shake of the hand. In the second game against Alastair McIntyre from the Waterfront the ends were exceptionally tight. Mcintyre stole in the first with a lovely freeze but Jamieson countered with a two and then forced the opposition to draw for the single, against 3, in the third. The fourth saw Jamieson in trouble throughout the end but a tap to the button set up a two which was quickly followed with a stolen two at the next. McIntyre stayed in contention with a single in the sixth but the game was closed out with another deuce in the 7th. Good first days work and only one other team undefeated in the section, Ron Caithness. Saturday's first game saw a top of the table clash against Ron Caithness of Forfar. Jamieson came out of the blocks quickly and by the close of end three the score was 4-0. A big miss in end four on last stone, after a perfectly played end, left a simple draw for two for Caithness. This was followed by a fluked removal of two Team Jamieson counters by Kennedy's first to leave their opponents lying 5. Damage limitation saw this reduced to a two and the game was level after 5. Two singles saw Jamieson take a two shot lead into the last but a guard that never made it into play gave Caithness the chance to level the game and it was gratefully accepted. Four misses from the Jamieson front end saw the team in another pile of trouble in the extra. Caithness lay guarded and on the back four and it was decided to play a tapped raise with the second last Jamieson stone, instead of clearing, due to the quarry of granite that lay out front. This was executed perfectly and Caithness's reply missed by inches and hands were gratefully shaken! Game two on Saturday was equal to the first in quality ends, except the first! On very slow "strike for a draw" ice Kennedy utilised his Elgin experience of such conditions to set up four in the house, which was then defended, a single in two gave a 5-0 lead. This time around though the front end kept things clean and although two's were exchanged the other ends were kept clear and blanked. Not pretty curling but effective in that they ensured a victory and with it certain qualification the way other results had gone. The final game saw a match up against David Hardie's Dumfries rink who were on three wins and desperate to clinch their own qualification with a win. Singles were exchanged in the first two ends with the skips having to make shots to save 3 shot reverses. Jamieson swung from hero to villain in the third when a well played clear end turned into a loss of two after back to back silent strikes. Spurred on by that reversal of fortunes Jamieson's rink constructed a superb fourth end with some stunning hit a rolls forcing errors from Hardie. This excellent play left Jamieson a simple draw for three and the lead, which was gratefully accepted. The fifth was blanked. In the sixth another well played end saw Hardie facing four counters through a slim port. The port was negotiated successfully but the stone travelled inches too far and a steal of four was recorded. Hands were shaken and five wins were on the board. So team Jamieson have qualified as group winners. Through to the Scottish Seniors Finals in Hamilton for the fourth year in a row. A strong field awaits them but they will be looking to go at least one better than in the past, as they have lost three semi-finals in a row. Hopefully they will be able to utilise those years of disappointment to ensure it is fourth time lucky. Winning the title would see them represent Scotland at the World Seniors which this year is being held in Dumfries in April. This coming weekend Willie Jamieson and his rink of Gordie Kennedy, Dave Kelly and Simon Elder will be in Ayr to try and qualify for their fourth consecutive Scottish Senior Championship. This season Team Jamieson have been drawn in the same group as David Hardie, Ron Caithness, Jim Cullen, Alistair Mcintyre and Alistair Galloway. With the top two teams from each section qualifying for the finals, Team Jamieson will have to be at their best to reach the Finals at the Lanarkshire Ice Rink, Hamilton. We wish Team Jamieson good luck and good curling! Since the last post all three Ballindalloch teams have played games in their respective leagues. Firstly , in Division 1, the undefeated Team Kennedy played Kenny Oswald's Elgin rink who were on the hunt for their first win of the season. In what would appear an upset Team Oswald took the 2points in a 7-5 win. Elsewhere, in Division 4, Mark Jacklin has stepped up from throwing lead rocks to skip Team Mackenzie. His first game skipping will be one to forget as he came up against an on form Andy Cameron who swept to a 15-1 win. We wish Team Mackenzie well in their next game against Amy MacDonald. Report on Team Scott's game vs John Farquhar to follow. The Province competition rules require score cards to be completed correctly and then signed by both skips. Sadly this is not always happening at the moment making the east and west match secretaries’ task of collating and recording scores unnecessarily tedious and difficult. I am sure you will appreciate that it is unreasonable to make their task as willing volunteers more difficult than it should be. I would ask all Province skips, therefore, to impress upon their team members, particularly those playing two, the requirement to carry out the necessary task of completing the score card correctly. Sadly, if this heartfelt plea should go unheeded, then the Executive Committee will have no option after the 29th November but to invoke the rules and penalise offenders. I hope this letter will be taken in the spirit in which it is intended, namely, to support our hard working match secretaries. I just read this interesting article on sweeping on the Canadian Curling association webpage, I think many of us could adopt few of these tips in our own game!! I have been asked many times if sweeping actually makes a difference or if it’s just a giant conspiracy to keep the players who aren’t throwing or skipping busy. The truth is this – sweeping can make a huge difference if it is done with proper technique. Unfortunately sweeping is often dismissed as something not worth practicing and some players do not develop the skills needed to be truly effective. I cannot emphasize enough how much improving sweeping skills can add to your team’s overall shot-making ability. That’s right; you need to make shots as a team and the sweeping is just as important as the throwing and the skipping. By using the following six tips you can take your team to a whole new level of awesome! 1. Start Close and Stay Close – Do NOT wait at the hogline to start sweeping. It is perfectly legal to stand nice and close to the thrower. I usually suggest starting at the T-line closest to the thrower. This way you can make sure you and the thrower both know what the shot is and what weight is expected. You’ll also have a clear view of whether or not the thrower should happen to push the stone or pull it back. You may be wondering how you’ll possibly keep up to the stone if you start that close. Here is the trick: when you see the thrower begin their backward motion, you start to walk and you continue to stay with the thrower as he or she slides. Remember to stay close to the stone all the way, even if it’s too heavy or obviously not going to make the requested shot. Your skip may have an alternate shot idea and if you’ve already given up and walked away, there’s less chance of sweeping to make plan B, C, or even D.
2. Communicate, Communicate, And Communicate – As soon as the stone is released, call out your best guess on where it’s going to end up immediately, loud and proud, and make sure the skipper can hear you. Sure, you might be wrong… in fact I guarantee you’ll be wrong more than once. The key is to keep giving your skip updates on the weight as the stone moves toward the other end. The more you practice guessing the weight and calling it out, the better you’ll get. Being a good judge of weight is an invaluable skill. Remember it takes time to develop this instinct so be patient and stick with it. 3. Look Up Often – It’s really easy to sweep like crazy because a stone is supposedly light, only to watch it sail out the back of the house. Looking up to see how fast the house is coming up is a great way to judge if you need to keep givin’ it all you’ve got or if you can let up a little. Think of looking up like taking a breath (breathing is something you should also remember to do when you sweep). You may find it easier to agree with your sweeping partner that the sweeper further away from the stone is the one who looks up. Just remember to share the information with your sweeping partner and skip, especially if you discover you need to stop or start sweeping. 4. Put Some Pressure On – Sweeping works by breaking down the pebble (bumps on the ice) to make a slicker surface for the rock to travel on. In order to effectively break down the pebble, friction is required. If you’re not putting enough pressure on your broom you may not be creating enough friction to be effective. Think about trying to force all of your body weight down on to the brush. It helps to get your head over top of the brush head. You can test your pressure by borrowing a hair broom. Try sweeping as you normally would with it. Do all the hairs on the brush spread out nice and evenly and wide when you push down and stay that way as you sweep down the ice? If not, add more pressure until you get the hairs to spread out. If you go back to a synthetic head or if you keep using hair (either is perfectly fine by the way; you should use whatever you find most comfortable) remember the amount of pressure you needed to spread the hairs and try to push that hard all the time. 5. Keep Sweeping Strokes and Tight and Quick – Remember you only need to sweep the running surface of the stone to be effective. You can use the surface area of the rock handle as a guide. If you are sweeping wider than the width of the handle you can afford to tighten your strokes. Keep your stokes tight and quick and you’ll soon see an improvement in your overall effectiveness. Sweeping is not supposed to be a walk in the park. After sweeping as hard as you can to the far end you should absolutely be out of breath… a lot. Here’s your chance to get a great workout every game. And if you think you can sweep harder, do it! You don’t want to have to question if you could have dragged a rock to the button instead of the eight-foot. 6. Sweep in Front of the Rock – This seems as if it should be obvious, but you’d be amazed if you knew how many curlers are awesome sweepers but completely ineffective! Take a look around at the other sweepers next time you play, and within moments, I bet you’ll see someone not sweeping in front of the rock. Often it is hard to tell if you are not sweeping in front of the rock. Ask your skip to let you know (gently and quietly of course) if you happen to stray from the path of the stone. Sweeping is fun and challenging and a great way to stay in shape. If you can incorporate any of these tips into your game I think you’ll be surprised by how quickly you start to see results. These six strategies combined are a wonderful secret weapon for any team to possess. Kim Perkins is the Head Curling Professional at the Calgary Winter Club. She has been teaching adults and children how to curl for 20 years. 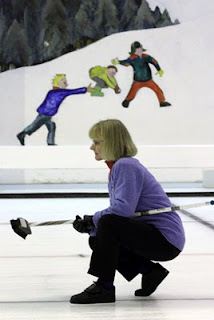 Kim wrote a children’s book about curling called The Adventures of Trefor the Curling Rock and is the proud inventor of Broom Charms www.trefor.ca. Life in Division 4 has turned out to be quite a challenge for Team Mackenzie. Having won Division 5 last season, Stuart and his rink of Bob Lawton, Gav Mackenzie and Mark Jacklin have only managed to take one point from their opening four games. Adding to the difficult start Skip, Stuart Mackenzie has been forced to retire, meaning the team are now searching for a replacement. Lynn Scott and her rink of Alan McIntyre, Robert Bremner and Don Gatt are once again battling it out in Province Division 3, aiming to collect their 5th league title in seven years. With one game to go before the first round of fixture is complete Team Scott is in a strong position. In the opening two games Team Scott got the better of both Alistair Maltman (7-5) and Mike Macdonald (5-3) before going down 8-4 to Ronald Christie. In their last outing Team Scott peeled 5-5 with Andrew Allardyce. Team Scott play their next game on Wednesday 11th December against John Farquhar. Moray Province East Division 3 table. Loch Ness -Not for the Faint Hearted!